Italian historian Professor Sergio Luzzatto has discovered documents including a letter from a pharmacist who arranged carbolic acid for Pio. 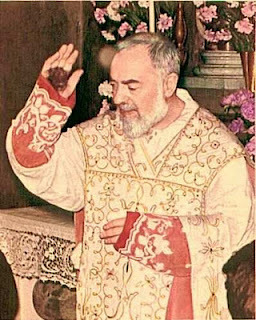 Professor Luzzatto suggests in Padre Pio: Miracle and Politics in a Secular Age that it was the corrosive acid that caused the bleeding on the saint's hands. Nevertheless, the carbolic acid theory was widely known during Pio's lifetime. The head of Milan's Catholic University of the Sacred Heart,Agostino Gemelli, thought Pio a "self-mutilating psychopath who exploited people's credulity", while a report compiled towards the end of his life for Pope John XXIII was said to be "devastatingly critical". It disappeared into a Vatican vault. Pio had great popular appeal but the Church hierarchy kept him at arm's length. It was only long after Pio was safely dead, and especially during the superstition-soaked pontificate of John Paul II that the Vatican came to look more kindly on his manifestations. There's a story that Pio predicted Karol Wojtyla's ascent to the papacy when the young Polish priest visited him in 1947. I must admit that, gullible as I am, I'd always been quite convinced by the psychosomatic theory. Unless he was actually a masochist (and there is undoubtedly a masochistic element in some traditional forms of Catholic devotion) pouring acid on your hands seems a rather extreme thing to do. Did he do it for the attention, or because he genuinely believed that faking a miracle promoted the faith of others? And if so, was he right? It could perhaps be argued that subjecting oneself to the agony of self-inflicted wounds in order to produce a miracle is a more "saintly" thing to do than merely to manifest the stigmata through no fault of one's own. It demonstrates self-sacrifice and devotion of a particularly stark kind. And the aim - to bring dull-witted people closer to God by providing "proof" of supernatural power - might be seen as worthy of praise, even if the means are somewhat questionable. Better to save souls through a colourful fraud than lose them by sticking to sermons.